This entry was posted in on November 22, 2017 . Afghanistan is a country with an extremely rich & complex history. Canada’s mission in Afghanistan is nothing less than complicated as well. All welcome to join us for an evening presentation, and discussion. Marie-Anne Hardy is an Infantry Sgt in the Canadian Army reserves. She deployed for 9 months as Canada’s only female Psychological Operations Tactical Operator in 2010/2011. 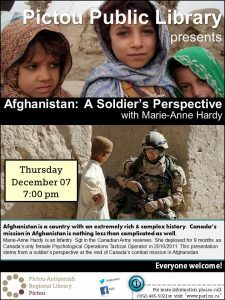 This presentation stems from a soldier’s perspective at the end of Canada’s combat mission in Afghanistan.